Get ready to have a great time with Aud Mini™ 6 Party! This portable Bluetooth® speaker is integrated with multicolor LEDs that bring your party to life by providing a fun visual and aural experience. The LEDs flash and strobe in multiple dazzling colors, and can be cycled through seven preset lighting themes. Pair your device wirelessly to Aud Mini™ 6 Party through Bluetooth® or plug in directly to the aux input. If you receive a call, the built-in speakerphone allows you to answer with a push of a button. 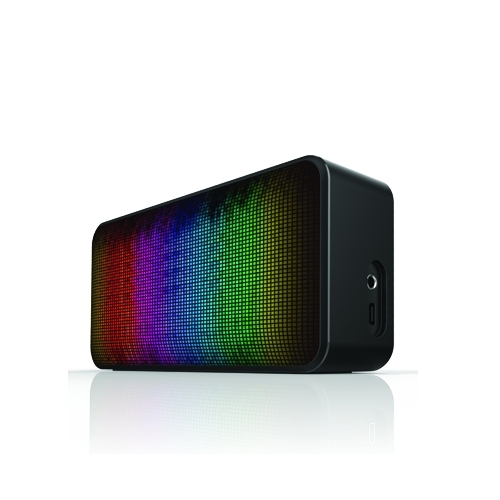 By combining lively, colorful lighting with bold, powerful sound, Aud Mini™ 6 Party makes every occasion a memorable one. Don’t just listen to your music - experience it. Aud Mini™ 6 Party has integrated multicolor LEDs that display a variety of vivid colors, providing the perfect visual complement to your music. Choose from seven dynamic lighting themes to bring your music to life. 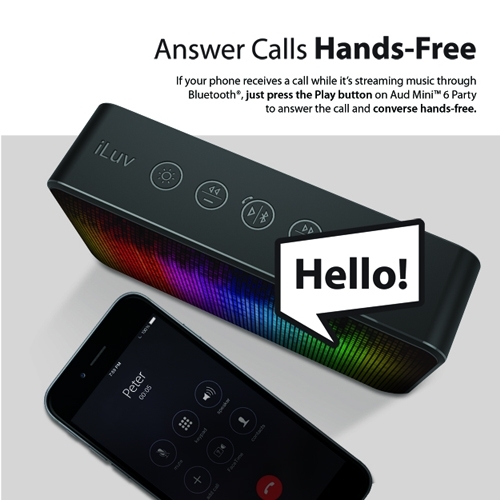 If your phone receives a call while it’s streaming music through Bluetooth®, just press the Play button on Aud Mini™ 6 Party to answer the call and converse hands-free. When the call ends, your music will resume playing automatically. Turn the volume up and get the party started. Aud Mini™ 6 Party is equipped with a full-range speaker and passive radiator that delivers big, bold sound to get everyone moving. Connect your smartphone or tablet to Aud Mini™ 6 Party via Bluetooth® to stream music wirelessly. Alternately, you can play music from your iPod® or any other 3.5mm audio device by plugging into the convenient aux input.